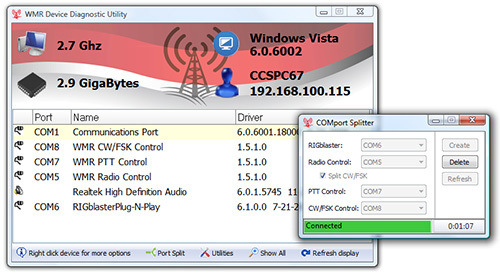 COMport Splitter software allows for two virtual COM ports that support popular digital mode programs! Operate a favorite digital mode program simultaneously with a favorite logging program. Download the WMR Diagnostics to access COMport Splitter. Works with any CAT program and any digital mode software simultaneously, including HRD/DM-780, N1MM/MMTTY, and Airlink Express. Virtual COMport Splitter software available for use with RIGblaster Advantage, Plus II, Plug & Play, and Duo.